You may be more familiar with the Maytag Repairman, but the company has been in business since 1907. Their goal from the beginning was to create washers that were durable and made from long lasting materials. The same concept still hold true for them today. Their main goal is to make their customers happy and provide them with appliances that will last a long time. Maytag’s products have improved over the years; they have grown with the times. The have used modern technology as well as advanced technology and that is what makes them a great company. 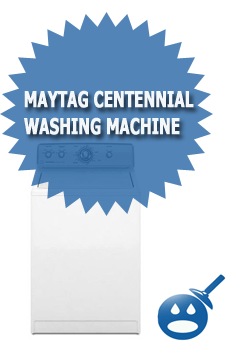 Maytag has a full product line that ranges from refrigerators to washers and dryers. Their washer product line is one of the best in the industry. 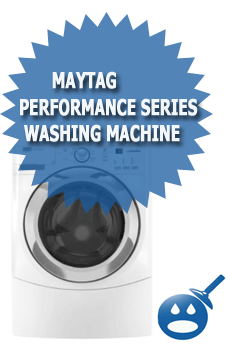 One of their premier selling washers is the Maytag Performance Series 4.0 Cu Ft Super Capacity Front Load Washer. 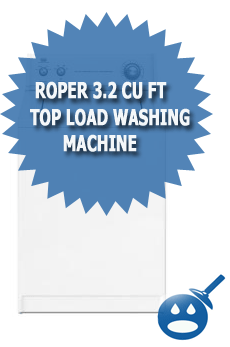 This washer is one of the most effective and efficient washers in the Maytag inventory. While this washer was designed for residential homes, it has been made with the Maytag Commercial Technology or MCT. This designs means that the Performance Series can handle any dirt and grime that gets on our clothes. 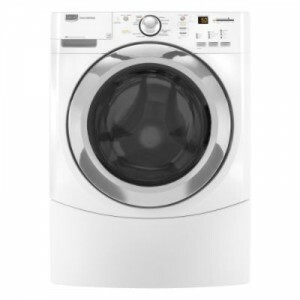 Let’s see what other specifications and benefits this washer has to offer. 99% of the bacteria from the clothes. This washer is equipped with the patented IntelliTemp Automatic Temperature Control and the IntelliFill Automatic Water Level Sensor. This washer has an End of Cycle Signal alerting you when your wash is ending. It has a time released detergent, bleach and fabric softener dispenser draw. This will save you time, you won’t have to keep running to the washer when you have to add the fabric softener to the bleach. 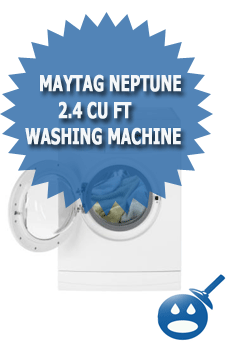 This Maytag Performance Series 4.0 Cu Ft Super Capacity Front Load Washer offers a 1,000-watt built in water heater.The capacity of this washer is 4 1/5 Cubic Feet. It is a compact washer that measures in 38″ in height x 31-1/2″ in diameter. This washer comes in 2 different colors, the White and Crimson. The Maytag Performance Series 4.0 Cu Ft Super Capacity Front Load Washer has Maytag’s own Smooth Balance Suspension System. The SuperSize Capacity Plus and the Sensi-Care Wash System. This washer has a delay option; you can put your clothes in the washer and then set the washer for up to 8 hours later. This washer has 10 different cycles with 3 different options, 4 temperature with 3 different soil levels. This washer was certified by the Energy Star System. You can save money with the Energy Star products; you will save energy and water when your washer is certified. This washer has some Eco Friendly Options. When you choose the Maytag Performance Series 4.0 Cu Ft Super Capacity Front Load Washer you can see on the yellow sticker that comes with every appliance how much money you can save. For example, on the Energy Guide Sticker for this washing machine will cost an estimated $17.00 when you use this washer with an electric water heater and when you use a gas water heater it will cost you an estimated $11.00 per year to operate. But the cost may vary depending on what your normal utility costs are. Maytag is one of the best names in the business. They offer high quality, high performance products. You will save money because these products are Energy Star Certified. You can save anywhere between 35% and 50% on water and 50% on energy when you use these products. There are so many different options on the Maytag Performance Series 4.0 Cu Ft Super Capacity Front Load Washer. With so many different options and washing cycles, you should have a great reliable washing every time. This washer is has a QuietSeries 300 Sound package, you will have a nice quiet running washing machine. There are different Eco Options and 10 different cycles. How many other washers have 10 different cycles. Though the features are vast there is no compromising of quality and reliability. Maytag is one of the most recognized names in the industry and as for repairs, if you have seen the Maytag Repair Man commercials, you will know the answer to that.